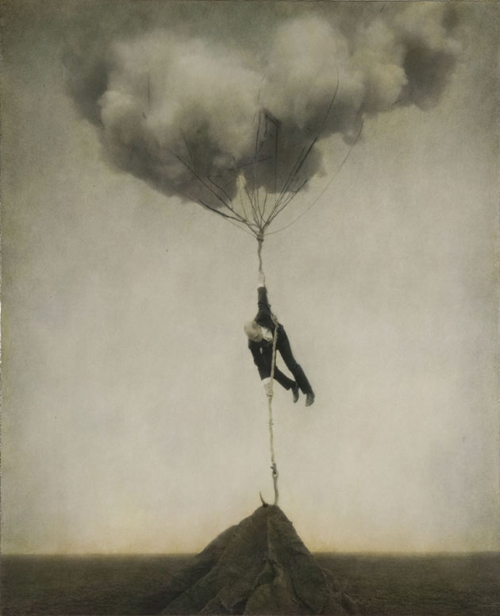 There is something mythic and heroic about the photographs of Robert and Shana ParkeHarrison. You can imagine discovering them stored away in some musty archive hidden among the overgrown brambles of the decaying ruin of an ancient city. The images appear to tell the story of an anonymous, black-suited civil servant who was given the task of maintaining the earth’s systems: tethering the sky to the land, insuring the wind didn’t stop blowing, keeping the shore and the sea from parting, patching holes in the sky, repairing the rain-making equipment, managing the change in seasons. The images make it clear the poor man was overwhelmed by the magnitude of the job, that it left him exhausted and spent. But he kept at it, quietly and determinedly, ritualistically, heroically, absurdly. Robert ParkeHarrison, who teaches photography at the College of Holy Cross in Worcester, MA, said of his work: "I want to make images that have open, narrative qualities, enough to suggest ideas about human limits. I want there to be a combination of the past juxtaposed with the modern…. These mythic images mirror our world, where nature is domesticated, controlled, and destroyed. Through my work I explore technology and a poetry of existence. These can be very heavy, overly didactic issues to convey in art, so I choose to portray them through a more theatrically absurd approach." These are political photographs without an overt political message. They’re art photographs in which the art is hidden. They’re landscape photographs in which the landscape is imaginary. They’re tragic photographs in which the tragedy is masked by the absurdity. They’re portraits in which the subject is Duty. 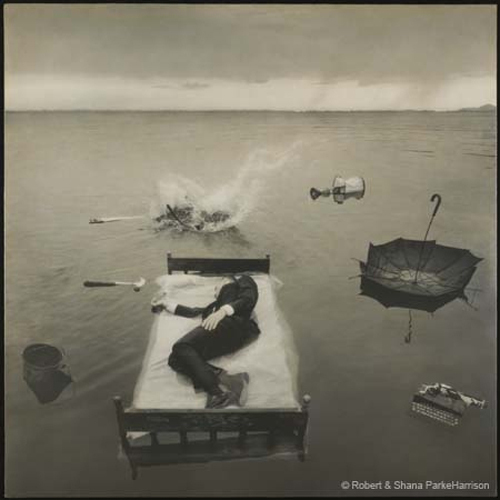 The work of Robert and Shana ParkeHarrison has been displayed internationally and can be found in museums and galleries throughout the world.